Recently, Fr Paul has written in Carmel reminding us of some matters concerning the celebration of Communion during Mass. Asking all of us to be consistent in how we process to the front of the church and receive communion is not simply about efficiency, safety and the like. A common bodily posture, to be observed by all those taking part, is a sign of the unity of the members of the Christian community gathered together for the Sacred Liturgy, for it expresses the intentions and spiritual attitude of the participants and also fosters them. As Fr Paul has also reminded us, when approaching to receive communion, we are asked to bow towards the Blessed Sacrament being given to us as a sign of reverence. This allows us to offer a common sign of reverence whilst maintaining the flow of the communion procession. Once we have received communion, the procession continues as we return to our seats. Everyone is encouraged to spend time in silent prayer after receiving communion, and people may choose to do this whilst kneeling or sitting. It is only at our seat, however, that this silent prayer should take place. Praying at the Marian Shrine or at the images of the saints, and asking for their intercession is something that many people find spiritually nourishing, but this is only appropriate before or after Mass. During Mass, our focus is rightly upon Christ, whose death and resurrection we celebrate, and whose body and blood we receive in holy communion. Recently we have been looking at the postures and gestures that we engage in during Mass. Each is intended to help us direct our minds and hearts more intently towards what we are celebrating. Last week, we looked at some of the gestures and postures that are used during the first part of the Liturgy of the Word, primarily the scripture readings. After the homily, we stand for the Profession of Faith and the Prayer of the Faithful. This is another time during the Mass where we stand as an assembly because we are actively engaged in the role of praying. Given that we are often told to “stand up for what we believe in”, it seems to make sense that we stand when we profess our faith. Outside of the Church, standing is a posture used for important occasions related to our beliefs and values, such as the national anthem or a minute’s silence on Anzac Day. To sit for such things (unless we are unable to stand, of course) is considered inappropriate and disrespectful. Standing can be interpreted as a sign of commitment, resolve and pride – all feelings that should exist within us when we profess our faith through the creed. The creed has within it another gesture to acknowledge an important element of our faith. Again, this is a gesture that has always been included in the missal, but has fallen into disuse. During the Profession of Faith, when we recall the incarnation and Jesus becoming man, we bow. Like other times when we bow, this is a sign of reverence, and is included in the rubrics of the missal for both the Niceno-Constantinopolitan and Apostle’s Creeds. Furthermore, when we celebrate this aspect of our faith at Christmas time, the missal asks us to genuflect instead; thus requiring of us an even more profound sign of reverence on such an important occasion. Finally, much of what I’ve written in Liturgy Links this year has been related to the introduction of the new English translation of the Roman Missal, which has gradually taken place since January. This week, our parish finally received its copy of the new edition of the Missal, meaning we can now celebrate the Mass in its entirety according to the new translation. You will notice differences to the Collect (Opening Prayer), Prayer over the Offerings and Prayer After Communion from now on. Use of the new translation is mandatory in Australia from All Saints Day. Last time, I began to discuss the concern one correspondent raised of the seemingly diminishing sense of the “real presence”, that is, our belief that Christ is fully present in the bread and wine we consecrate at Mass, and thus consume as his body and blood. It is a belief that Catholics have held for many centuries, although different Christian Churches have different theological viewpoints and understandings. Some Christian Churches do not believe in Christ’s presence in the Eucharistic elements. Bishop Manning has written on this topic many times, and has also noticed a change of attitude towards the presence of Christ in the Eucharist. A sense of the mystery of this great gift of Christ has been lost for many. As I said last time, I believe there are a number of factors that have contributed to this. The first centres around the practices we teach our children from a young age around giving reverence to the Eucharist. Whenever we enter a church or a Blessed Sacrament Chapel where there is a tabernacle, we should genuflect towards it. We need to teach those learning about our faith about the lamp that burns alongside the tabernacle and its purpose of indicating the presence of Christ. During Mass, when we are next to receive communion, we should bow to acknowledge the presence of Christ in the Eucharist we are about to receive. 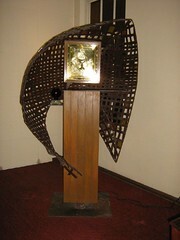 We also need to show appropriate reverence to the altar as the place where this mystery is realised. 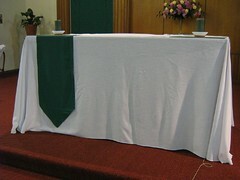 In churches where the tabernacle is in a separate Blessed Sacrament Chapel (as at Greystanes, Toongabbie, or Parramatta for example), the appropriate reverence upon entering the church is a bow to the altar. The altar should only be used for the celebration of the Eucharist, and only hold those things required for it. It is not merely a table where we rest things for the sake of convenience! When we celebrate the Eucharist, the altar is the centre around which we gather and is a key focal point, whereas the tabernacle would be a focal point at other times of personal prayer, devotion and adoration. As we approach Pentecost Sunday, and the implementation of a new edition of the General Instruction of the Roman Missal, we have been looking at the some the small changes this new General Instruction will make to the celebration of Mass. There is only one other change that will be required of the entire liturgical assembly. This centres on the way we give reverence to the Blessed Sacrament as we approach to receive Communion. At present, you may see people make one of a number of signs of reverence. These may include genuflecting, bowing, or making the sign of the cross. A sign of reverence to acknowledge Christ present in the bread and wine is a worthy practice. The new edition of the General Instruction asks that we, as a people formed into one Body of Christ when we worship, unify our practice in a common gesture. Therefore, we are being asked to bow to the Blessed Sacrament being ministered to us by the priest or Communion Minister. 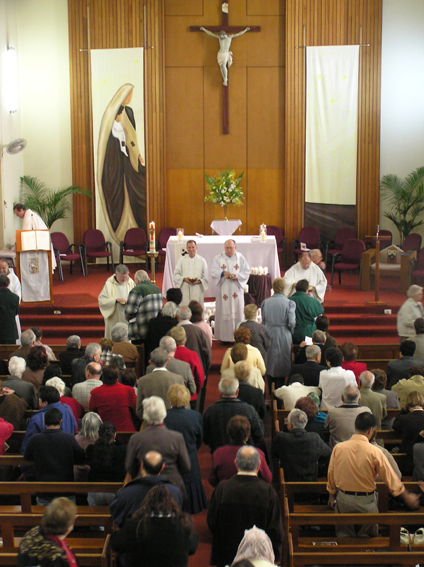 In Wentworthville, the most appropriate and practical time for us to bow is when we reach the front of the aisle and the person before us is receiving Communion. You do not need to bow a second time if you wish to receive Communion from the chalice as well. Like our changed practice of standing after the Preparation of the Gifts, this change is an easy one that will soon become habit. We explain both these changes to you at Masses closer to Pentecost Sunday, when they will take effect.